So here is my 366th blog post on the 366th day of the year. Funny how that worked out. I'm having a scattered but mostly enjoyable winter break though it is going faster than I'd like. Aside from some brief travel to visit my Mom in New York, we've just been hanging around the house. One thing I've been working on is learning Etoys programming for a possible space-themed middle school science teaching unit. 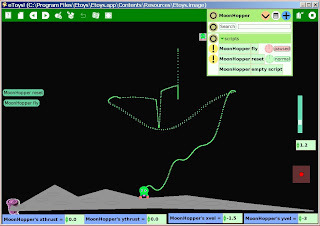 So far I've written a simple prototype "Moonhopper" project for exploration of 2D motion with gravity, hover engines, thrusters, etc. On a completely different tack, I've resurrected the ailing desktop PC I used to use for recording projects. This 2002-era Dell had become incredibly slow and unstable. I reinstalled Windows XP, upgraded to 1 GB of RAM, and reinstalled my music applications including Band in a Box 2007 and SONAR 3 (several versions old now but still OK for me). The computer is reasonably zippy now. I even started to write a new song, the first in over a year. I'm also reconnecting and testing my MIDI and audio gear so I'll be ready to record. I've also got another book underway, Isaac Newton by James Gleick. He really brings the strange and brilliant Sir Isaac to life. Finally, thanks to Hobby Space (RLV/Space Transport News), I learned about a great list of the top 100 space and astronomy blogs at Find-Schools-Online.com and was flattered to find Music of the Spheres on the list at #27 (not a ranking, it's arranged by category). Cool! The other day I wrote about SpaceX and the ISS resupply contract they recently received from NASA. I showed an Orbiter screen shot of the Falcon 9 launch vehicle, and commented that I wasn't sure of the status of SpaceX add-on developments for Orbiter. Checking into this over at Orbit Hangar, I first learned that the Orbit Hangar web site itself has just been given a major overhaul, with a new look and new search and browsing features. Cool! And there have been some SpaceX add-on developments since I last looked in maybe March 2008. There is a "beta" of Glider's "SpaceX Launchers and Dragon 0.58" from April or May 2008. Based on limited testing with the Falcon 9 and Dragon on supplied scenarios, this looks pretty good and is mostly working, though I had some difficulty with rotational control using thrusters. The Dragon capsule and service module are separate spacecraft, so you need to use [F3] to choose the right one for some actions (e.g., K will open the solar panels if the service module is selected). 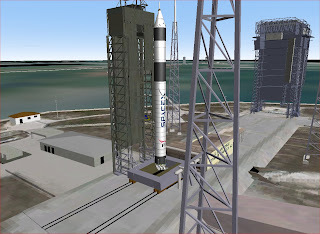 There is also "Falcon 9 - Dragon Beta 3" by MajorTom, dated April 13, 2008. I didn't test this one. At one point, Glider and MajorTom were working on merging their SpaceX projects and I think this probably happened, but I'm not sure. Glider's version seems more complete but there isn't much documentation. The latest development is based on Glider's add-on, "SpaceX Lunar Tourism" by Henry the Orbiter. 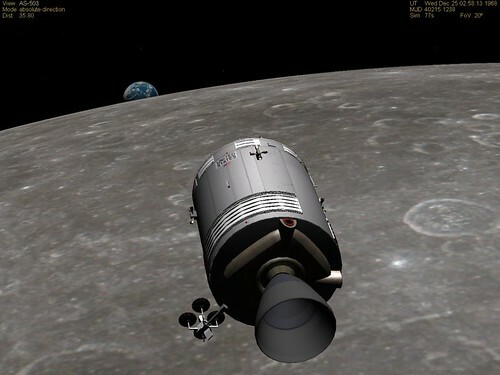 This simulates a hypothetical free-return mission (once around the Moon and back to Earth). It involves two launches, a Falcon 9 Heavy (27 first stage engines!) carrying a "TLI Kicker Stage" and a regular Falcon 9 carrying the Dragon with the pilot and six tourists. 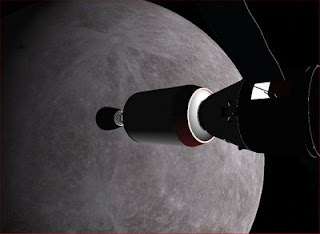 The Dragon docks with the TLI stage in low Earth orbit, and the TLI Kicker Stage is fired to send them around the Moon. 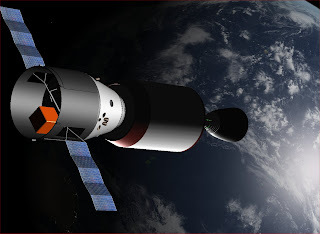 I only tried a few scenarios including post-TLI, around the Moon, and returning to a hard impact in southern Africa (I skipped the mid-course corrections and re-entry preps, oops). It was cool to watch the Moon get bigger and bigger, to not hit it, and to see the Earth emerge on the other side! This add-on includes some documentation on SpaceX, Glider's add-on, and the Moon mission. I finally finished Goodwin's Team of Rivals, and it is every bit as good as reviewers have said, one of the best works of history and biography I have read. The subtitle refers to the "political genius" of Abraham Lincoln, and he clearly was a genius in many ways - in choosing people, in understanding complex situations, in disarming tensions, and most of all in timing. He would weather severe criticism and delay action in situations where even his closest friends and supporters questioned whether he understood the nature of the crisis. But with well-timed action, Lincoln would resolve the crisis with the fewest possible side effects. In chess terms, he was looking ahead through many possible moves and counter moves, but this was not only an intellectual judgment. He understood the complex interplay of tensions and feelings among his cabinet members and generals as well as with the soldiers and with the general public in the North and even in the South. Lincoln's intellect was great, as was his ability to communicate complex issues simply but accurately. But it was his empathy that held it all together. He truly felt the pain of all the players - his cabinet members, his generals, and the soldiers he would often visit throughout the Civil War. But somehow he was able to absorb and dissipate all this pain and maintain his spirits and his ability to focus. Team of Rivals shows you the Civil War from the point of view of Lincoln, his family, and his cabinet members. They had plenty of direct contact with the war and its effects - many of the biggest battles were within 100 miles of the White House, and some much closer. But the war itself is still somewhat abstract. So when I came across a Civil War book my daughter had read in school some years ago, I decided to do a quick supplemental read. I actually read Soldier's Heart once before. Gary Paulsen is one of my favorite authors, even though he is known mainly as an author for young readers. The subtitle of Soldier's Heart is "Being the Story of the Enlistment and Due Service of the Boy Charley Goddard in the First Minnesota Volunteers," and it is the brief, slightly fictionalized story of a real 15 year old boy who lied about his age to enlist in the Union army 1861. He fought in several major battles, but there is little in the way of big picture perspective here - it is pure experience and feelings, as visceral as any war book I have ever read. I strongly recommend both Team of Rivals and Soldier's Heart. My sister did the impossible this year: she gave me a space book that I had wanted but didn't yet own. 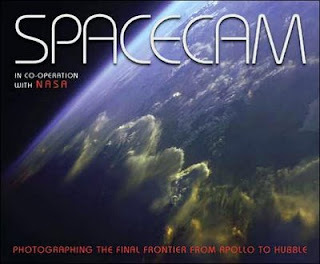 Spacecam by Terry Hope (subtitle "Photographing the final frontier from Apollo to Hubble") is something of a sampler, with "looking out" chapters on man in space (Moon and Earth orbit), the planets, and beyond the solar system (mainly Hubble images), and three "looking back" chapters with wonderful Earth imagery (geography, weather & climate, dramatic incidents). The 300 mostly large color photos are well chosen and printed with high quality. The captions are useful and mostly accurate (though I noticed a few errors). 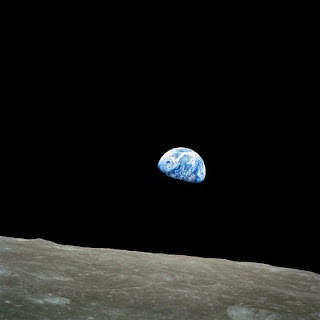 Apollo 8, December 24, 1968. NASA announced today that the SpaceX Falcon 9 launch vehicle and Dragon spacecraft have officially been selected for ISS Cargo Resupply Services. This system will replace the shuttle for US cargo deliveries to the ISS after 2010. More details here. SpaceX also announced that the first Falcon 9 test vehicle will be fully integrated at Cape Canaveral by December 31. I don't know when the first F9 test launch will take place in 2009, but this certainly is progress. The picture shows a Falcon 9 model in Orbiter, a few minutes after launch from the Cape. 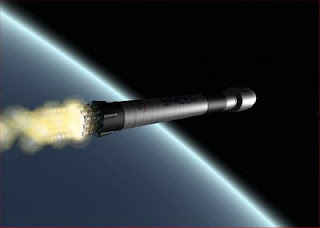 Notice the nine first stage engines burning. The payload isn't a Dragon but a satellite in a large faring as shown on the SpaceX Falcon 9 main page. I haven't checked for a while on SpaceX add-on developments for Orbiter. There were several things in work earlier this year but I don't think anything was completed. I have some Falcon and Dragon screen shots from Orbiter on Flickr. My family and I have been lucky (so far) in not being greatly affected by the current recession. So as the year comes to a close, I'm making some additional donations to causes I support. One is the UN High Commissioner for Refugees (UNHCR). A major USA for UNHCR donor has provided a $1 million challenge grant to match individual contributions dollar for dollar until the end of the year in support of Darfur refugees, so it's a good time to donate if you can. I was also reminded in a "personal email" from Michelle Obama that there are many people here in the US who need help too, and one way to help people in your own area is to donate to a local food bank. You can check the phone book or enter your location at Feeding America to find a food bank near you. It's also a good thing to remember those who are serving in the armed forces. I wish the US weren't involved in two wars, but unfortunately we are and will be for a while longer. One thing you can do is donate to the USO so they can send out care packages to men and women who are doing some really tough jobs far from home. Apollo 8 Launch: 40 Years! Oops, wrong anniversary. But forty years ago today, the first manned moon mission was launched. Apollo 8 carried Frank Borman, Jim Lovell, and William Anders on their historic moon-orbiting flight. It was also the first manned launch of the mighty Saturn V booster. Astroprof has done a great job summing up the mission and the circumstances that led up to it, so I'll refer you to his post for the details. 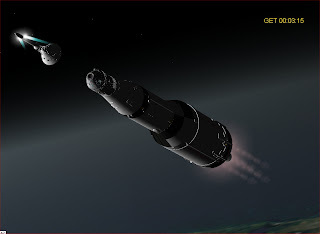 In honor of this anniversary, I fired up Orbiter and AMSO to do a virtual recreation of the Apollo 8 launch, and my virtual astronauts are now in Earth orbit awaiting my calculations for the TLI (trans-lunar injection) burn. I better make sure they don't miss their window. My Orbiter screen shot shows something that was never actually photographed, the separation of the launch escape system from the command module a few seconds after first stage separation (about 3 minutes after launch, GET = ground elapsed time). That just about sums it up! Rob is an award-winning writer, musician, and speaker who lives in Nashville. We've been friends since we met as fellow students at Carnegie-Mellon University and started writing and performing music together just a few short decades ago. His web site displays a pretty good cross section of his work, including articles, books, music industry artist bios, songs, and poetry. I highly recommend his book Daughter of the Air, a biography of pioneering female aviator Cornelia Fort. In 2007 I read Kim Stanley Robinson's "Science in the Capital" trilogy, Forty Signs of Rain (2004), Fifty Degrees Below (2005), and Sixty Days and Counting (2007). Set in the near future, they portray some dramatic effects of rapid climate change and the efforts of scientists at the National Science Foundation (and elsewhere) to solve these problems. These are political novels as much (or more than) science fiction, and I really enjoyed all three books. Robinson is best known for his Mars Trilogy, and while some of his characters are quirky, the science is well researched, and the portrayal of the scientists and their work seems very plausible. What seemed harder to believe in the dark depths of the Bush adminstration was the election of a president who takes science and scientists seriously. From space politics to space aliens, from conferences on Earth to avalanches on Mars, from local planets to exoplanets to the best of 2008, Carnival of Space #84 offers you 25 byte sized chunks of the universe to explore, hosted by Next Big Future. The video here is #5 in Bad Astronomy's post on the top 10 astronomy images of 2008 - the moon transiting Earth as captured by the Deep Impact/EPOXI spacecraft back in May. Amazing! There are zillions of "apps" for the iPhone and iPod Touch, most of them games, and many of them free or costing only 99 cents (I read an article somewhere saying that some people are making tens of thousands of dollars a month selling low-cost apps on iTunes). Aside from music and video (movies and YouTube), my most frequently used apps are the New York Times reader, eReader (for reading ebooks), WeatherBug, and StarMap. I have quite a few musical instrument apps too, but it seems the main use of those is to show people how cool the iPod Touch is. Otherwise, a real guitar or keyboard works much better. I've also downloaded many games, though I usually end up deleting them after trying them a few times. I'm really not a big game person. But Trace is a tiny exception. It's great for wasting little slices of time here and there. You've got this little stick figure character you can move with arrow and jump buttons. You have to walk him across the screen to a little yellow sun target, avoiding various fixed and moving obstacles that will send you back to the start. You do this by drawing lines with your finger - your character uses these lines as platforms or bridges over and around the obstacles. Sound easy? Sometimes it is, but often you have to solve a puzzle or use careful timing to get through. The graphics are child like and often funny. It's really a lot of fun. And it's free! 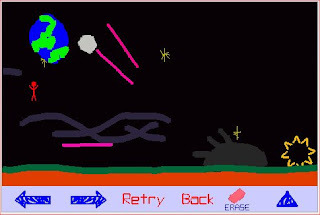 The screen above is from "Space," one of six "worlds" in the game. Each world has its own music (which you can turn off) and about 20 levels. This video shows examples from most of the worlds (this shows an earlier version of the game where the character was just a little red line). Astronomical Computer from 150 B.C.E. This is really cool. A British museum curator has built a working replica of a 2,000 year old Greek machine that is actually a precision mechanical computer for astronomical calculations. He spent years studying the rusted and broken pieces of the "Antikythera" that were recovered from under the sea near Greece in 1902. This is quite impressive, although as some YouTube commenters have brilliantly pointed out, calling it a "computer" is questionable since this primitive device doesn't even support Instant Messaging. 1. Coalition for Space Exploration Policy Recommendations - The report is mainly a summary of special Gallup polls showing strong public support for space exploration. The Coalition is made up of mainstream aerospace industry companies (Boeing, Lockheed-Martin, ATK, etc.) and space advocacy groups. 2. 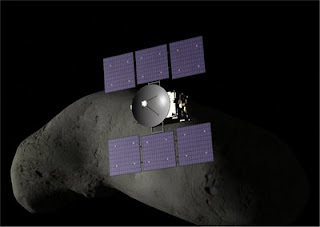 X Prize - The X Prize organization offers some suggestions on how NASA can work better. Because NEO impacts represent a global, long-term threat to the collective welfare of humanity, an international program and set of preparatory measures for action should be established. We humans evolved to deal very well with certain time spans (seconds to hours to a few years) and to judge well the probabilities and impacts of certain types of events and threats (predators, prey, day/night, weather). With very short or very long time spans and for very small probabilities, our instincts aren't very good, but fortunately, we have science, and the ability to learn from things that are distant and abstract. Asteroids are like that. Long periods can pass with no big asteroid events, but there's nothing special about this time compared to 65 million years ago or 1908. Now is as likely a time for an asteroid to hit as any other. This proposal is basically asking us to spend what is really a small amount of money and a bit more attention to a low probability risk with big consequences. It really is like insurance and fire extinguishers - something we should assign a little money and attention to while we devote a lot more money and attention to more immediate problems. The proposal is also suggesting improvements in international planning and cooperation on this important issue, and explaining why such cooperation is essential. The Obama transition team is inviting Americans to participate in the various discussions of issues that may be important to them. If you care about space exploration and the risk of NEO impacts, please add your voice to these discussions. One of the great things about the Obama transition is that the public is invited to participate, to have "a seat at the table," as they put it on the change.gov web site. They have invited proposals from outside groups (37 pages of links so far) with the provision that all documents submitted will become public (they are PDF files on the web site). You can read them and then join in the discussion through forums associated with these proposals. Open government! 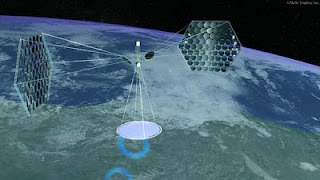 I just learned about a proposal on space solar power (SSP) that is under discussion there. I read the brief proposal and browsed many of the comments. Although there are some off-the-wall comments as in any public forum, the discussion is impressively multi-level and well informed. I rated a number of comments (thumbs up or down) and added a general comment to one of the most informative posts. If you care about this issue, you should go read, vote, and comment. Of course there is no guarantee that SSP will be pursued by the Obama administration. It's one of hundreds of proposals. But the fact that these discussions are happening is in itself such a hopeful sign. This combined with the impressive cabinet and other appointments that have been announced shows that change is indeed coming. We will soon have leaders in Washington who don't have their heads in the sand! Or wherever the current administration's heads have been. P.S. It's not very clear on change.gov, but the forums are run by IntenseDebate.com, and to register for the forums, you need to set up a free account there, even if you have registered at change.gov for other things (as I had done). If you'd like a daily (or just occasional) audio fix of "space stuff," check out Discovery Now, a free 90 second daily podcast on aerospace topics from the National Institute of Aerospace. Of course you can't go very deep into anything in 90 seconds, but you might learn something interesting. Recent topics include VASIMIR rockets, geysers on Enceladus, Galileo (the dude, not the spacecraft), and "supercomputers for smooth flying." You can access the MP3's or subscribe to the podcasts through their web site, or you can get them through iTunes. The Discovery Now web site also has a few lesson plans on space related topics. 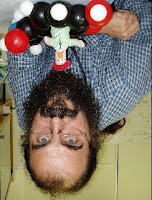 Be sure to check out this week's Carnival of Space - it's the Antipodean Edition, hosted by Ian Musgrave's Astroblog. Ian hails from Adelaide, Australia, and he provides startling photographic evidence of what it's like to live on the bottom of a world (Earth in this case). When I was in Australia in June/July 2006, I saw the southern sky for the first time, and on a visit to a very dark national park at Jervis Bay, the super-bright Milky Way over our heads was a dazzling sight. But it was amazing how quickly the upside down feeling passed. Not much time for blogging this weekend. A nasty New England ice storm knocked out our power yesterday (along with hundreds of thousands of other Massachusetts and New Hampshire homes). We were lucky enough to get power back after only 15 hours or so, while news reports indicate that it may take three days or more for many in the region. We have a lot of downed tree branches but no damage to the house. Internet access was messed up too. But it could have been much worse. I'll be busy the rest of the weekend, a Neil Young concert tonight, a family event tomorrow. How big is our galaxy? If the Solar System, from the Sun all the way out to Pluto, were shrunk to the size of a U.S. quarter [a coin about 24 mm in diameter], the Milky Way would be the size of North America. 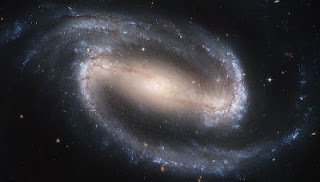 The picture is a Hubble image of the barred spiral galaxy NGC 1300. Evidence from radio and infrared astronomy suggests that our Milky Way Galaxy is also a barred spiral. I just sat in on an excellent 90 minute phone/web training session for JPL Solar System Ambassadors and other educators. The subject was IYA 2009 - the upcoming International Year of Astronomy, celebrating 400 years since Galileo first used a telescope to observe the cosmos (watch the great IYA2009 introductory video here - choose high quality if you can). There are many events being planned, with extensive web support from various organizations, much of it already in place. There's a designated theme for each month of the year, starting with "Telescopes and Space Probes: Today's Starry Messengers" in January. That January page includes links to other pages with activities, videos, and PowerPoints as well as a PDF "IYA Discovery Guide" for the month (all 12 guides are listed here). January's guide includes methods and tips for observation with and without a telescope, as well as a profile of Venus, the featured observing object for the month. 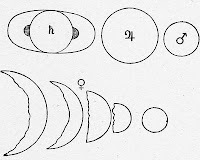 Galileo observed the phases of Venus with his telescope (see Galileo's 1610 sketches below) and showed that this was direct evidence that Venus is orbiting the sun rather than the Earth (and that Venus orbits closer to the sun than does the Earth). 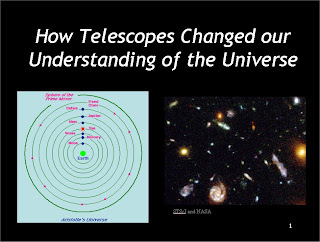 The January page also points to an excellent presentation from the Night Sky Network, "How Telescopes Changed Our Understanding of the Universe." 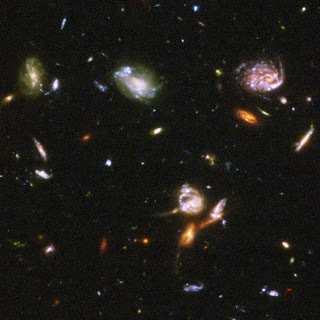 It identifies many of the key questions about our place in the cosmos and how ever improving telescopes helped us to answer those questions. The explanatory graphics in this PowerPoint are great. There's so much to explore, and if you are an educator (formal or in- ) and/or a member of an astronomy club as I am, January 10 will be a special target day for doing a star party or other observational event. The goal is to kick off the year by getting as many people as possible observing the universe around us that night. I better get busy preparing for all this stuff! This always happens (OK, it's the second time). I neglect to submit a post for the Carnival of Space, and Dave Mosher of Space Disco is the host and does something really cool and different with the carnival. This time it's a video of all the posts. And there are a lot of good ones. But none of mine, since I was fooling around with visual programming software this past week instead of walking my space beat like a responsible space blogger. But as Mr. Spock was always telling Captain Kirk, "Dude, you snooze, you lose." Lecture: What Killed the Dinosaurs? You probably know something about what wiped out the dinosaurs, but do you know how scientists figured this out? I just listened to a very interesting lecture on this subject from The Teaching Company. I've bought a few of their DVD and audio courses and I noticed this free lecture listed on my account page. I thought it might be for customers only, but a Google search also found it, so I guess it's available to anyone (at least for now). The lecturer is Professor Peter Ward, a paleontologist at the University of Washington. P.S. The Teaching Company is having one of their frequent sales and many of their courses are deeply discounted. Our ultimate goal is a world full of playfully creative people who are constantly inventing new opportunities for themselves and their communities. "Playfully creative" is probably the best way to describe the implicit goal that seems to connect all the crazy threads of my life - songwriting, guitar, performing, flying, foreign languages, diverse reading, writing, programming, traveling, exploring various technologies, teaching, etc. I like nothing better than to learn something new that is complex, full of potential, and somehow connected to my other interests. 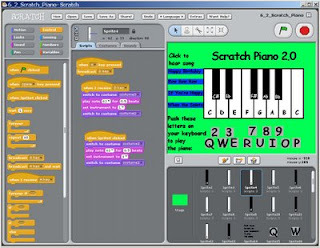 Case in point: Etoys and now also Scratch, a similar drag-and-drop visual programming language developed and released (for free) by the MIT Media Lab. I've downloaded, installed, and played a bit with it, using its very intuitive "snap together" programming blocks. I haven't been able to explore any of the many user projects uploaded to the Scratch gallery because the Scratch server won't open for me - perhaps it's just overloaded. But I did find a great site called learnscratch.org which has at least 30 example projects with detailed tutorials, and I tried a bunch of them. The picture here is a simple piano keyboard project (each key is a separate "sprite" with its own scripts). I'm still learning Etoys and have barely started to explore Scratch. It's clear that Scratch is more immediately intuitive and in some respects more polished than Etoys. It also seems to have a more extensive "infrastructure" including a social networking aspect through the Scratch web site (which I would love to see - I was only able to get to the download page very late last night and nothing will open on the site today). It's probably easier to get started teaching younger children with Scratch than with Etoys. But I have a feeling that Etoys is more powerful and extensible for the middle school space/physics projects that I hope to develop starting in the next few weeks. Both of these environments are amazingly empowering and bring new meaning to the word "interactive" (both also operate equally well in many different world languages). One of my favorite SF books is Orbital Resonance by John Barnes (I've written before about his Meme Wars series). It takes place on a "lifeboat" space colony "resonating" between Earth and Mars in the near future (after a series of Earth-threatening catastrophes), and the narrator is a very bright 13 year old girl. The colony's education system is radically different from our current system and is geared toward creating smart, flexible, capable citizens and leaders to help the human race survive its precarious situation. Many of the school projects that are assigned involve creating complex computer simulations of scientific, technical, and social systems, a necessary part of understanding problems and making good decisions in their very challenging circumstances. I wondered how kids in such a world could manage to do that so quickly and efficiently. Now that I've seen Etoys and Scratch, I have a lot better idea of how something like that might really be possible. P.S. MY BAD on problems with the Scratch web site. It was a firewall security problem that I sometimes have with certain web sites. I just visited the Scratch site and it's got a lot of really great features and a very active user community. Although I haven't done any flying as a private pilot in over three years, I still have a strong interest in aviation and hope to get back to regular flying one of these days. So I keep renewing my AOPA membership, and for 2009 I added the optional subscription to AOPA Flight Training in addition to the standard AOPA Pilot magazine. It's been so long that I will need to review a lot of basic things if I seriously hope to get back in the cockpit. 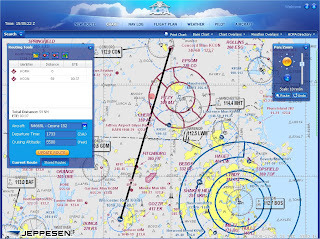 While renewing, I checked out the AOPA web site and noticed they have introduced a new web-based flight planning tool, developed by Jeppesen. I planned a simple flight just to check it out, and it's pretty nice, quite adequate for planning VFR flights (though of course you still need to carry current paper charts). Very cool, and free to AOPA members. I wish I could go flying today - it's a great VFR day. JPL has announced that the Mars Science Laboratory (MSL) will launch in 2011 rather than in fall 2009 as originally planned. There's just too much development and testing still left to do on the giant new rover to safely make the 2009 Mars launch window. Better safe than sorry, as long as they can manage to keep the program's funding going until 2011. MSL is a big, expensive project and while the 2004 Mars rovers have been a great hit with the public, NASA funding is bound to be tight in the next few years, and there are other NASA unmanned science programs competing for those limited funds. On the bright side: more time for kids to name the new rover with the help of Pixar's fictional robot WALL-E (I just bought and watched the WALL-E DVD, and I liked it even better seeing it the second time, even if the space physics is just a wee bit unrealistic). This also gives more time for some enterprising Orbiter add-on developer to create a MSL add-on! In the meantime, Scott Conklin's excellent MER-2003 add-on will let you play around with Spirit and Opportunity if you'd like to do some virtual launching, landing, and roving. 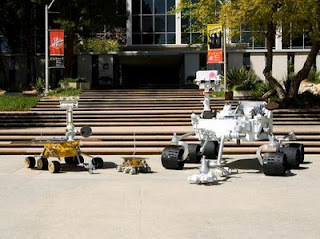 The JPL picture above shows three generations of Mars rovers including tiny Sojourner and SUV-sized MSL. Poor Side of Town - Johnny A.
I found a forgotten box of vinyl record albums in the basement the other day. 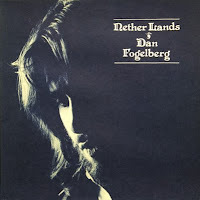 One of the albums was Nether Lands, a 1977 record by the late Dan Fogelberg. While I like some of Dan's music, I was never really a major fan - except for this album! When I read some of the lyrics, I suddenly realized what a favorite this record was back in the day. How could I have forgotten it? I thought about transferring the vinyl record to MP3, which I have done with some old records with disappointing results. 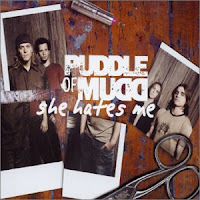 I looked on Amazon and found the CD was available for $4.99, and today it arrived (I'm such an Amazon junkie that I have a "Prime" account which gives me free two day shipping on almost everything). What a great record! There are no big hit singles - it's one of those albums that works best as an complete work. Good lyrics, beautifully recorded acoustic instruments, cool harmonies, lush but not overbearing orchestration. Nice. Following up on my Etoys post from yesterday, here's some information about OLPC. The video is from December 2007 so it's not completely up to date on OLPC status and the "Give One, Get One" program, but Nicholas Negroponte is a great speaker, he gives you the essential background on the program, and of course he's one of the people who made OLPC happen. For more up to date information, check out the OLPC Blog (the November 23 entry has a video of a recent interview with Negroponte on Charlie Rose). There is a new Give One, Get One (G1G1) program now supported by Amazon.com (give an XO laptop to a child in a poor country for $199, give one and get one for yourself for $399). There are also some international G1G1 programs now.